Cannon Montoya was introduced to surfing like many local groms, catching the waves of San Clemente’s best breaks as his father rode on the back of his longboard. He started surfing at about the age of 5 with his father, Brandon Montoya, pushing him into waves. “My dad has taught me to surf ever since, and I go surfing as much as I can,” said Cannon. Now at 8 years old, Cannon is a Western Surfing Association (WSA) competitor paddling into the competition all on his own. “It’s a whole different perspective watching from the beach,” said Brandon, adding that it is also an exciting sight to see. Last year was Cannon’s first competing in the WSA, where he finished in the No. 12 spot of the Micro Grom Boys U9 Division. 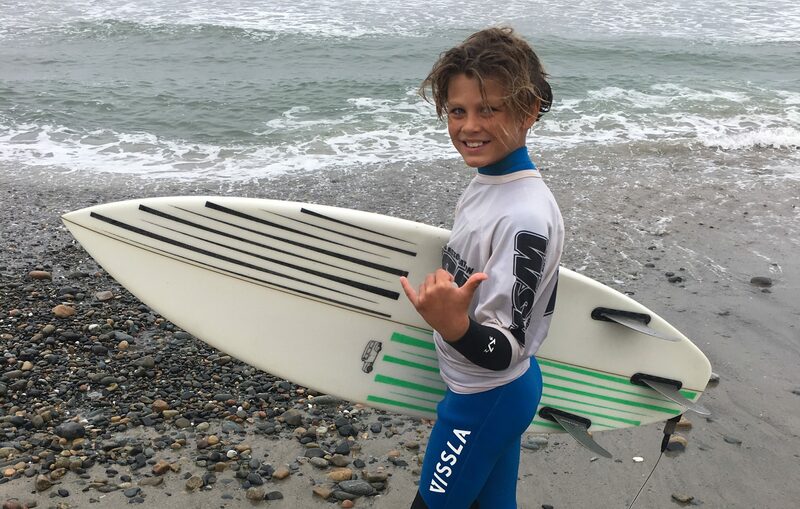 Cannon also enjoys competing in other mini surf series and events like the Positive Vibe Warriors Foundation’s STOKE-O-RAMA, an annual fundraising event and surf contest for kids 12 and under put on by the Gudauskas family. “Everyone is really happy and stoked, and you get to see a bunch of friends,” said Cannon when talking about the STOKE-O-RAMA. As the oldest of three siblings, Cannon said he likes surfing with his dad and his younger brother, Brooks, who he will occasionally help push into waves as his father did for him. His favorite surf spots are Lower Trestles and Riviera, and his favorite board to ride is the shortboard his father shaped for him at his friend’s shaping bay on Los Molinos. “I’ve been shaping about 10 years, and I love watching him surf it; he’s there during the process” said Brandon, explaining that Cannon got to play a part of the process in designing his board. Not only does Cannon like to help design his surfboards, but he also likes to draw and spray paint skateboards with his friends. “I design skateboards and spray paint old skateboards, and sell them to the neighbors” said Cannon, who has already sold one skateboard he designed. Cannon said when he grows up, he wants to be a pro surfer or pro skateboarder, looking up to surfers like John John Florence and Dane Reynolds, and skateboarders like Greyson Fletcher and Ryan Sheckler. He attends Concordia Elementary school, and said if he could travel anywhere to surf he would like to surf in Hawaii or Indonesia.